You might think that the selling points of these key positions would speak for themselves, but finding exceptional senior leadership talent in the educational sector – one that rarely has great publicity in the general press – is quite a challenge. This is also the case if we were to avoid the expensive and traditional professional trade press. Avoiding the TES for such high profile roles (x3 Heads of Faculty and a Business Manager), our campaign focused on social media – identifying and engaging with over 30 different discussion groups, forums and channels where we thought the roles would be of interest. The reach of our campaigns far exceeded that of the TES’s and crucially we had a 6 week campaign that targeted a passive audience. 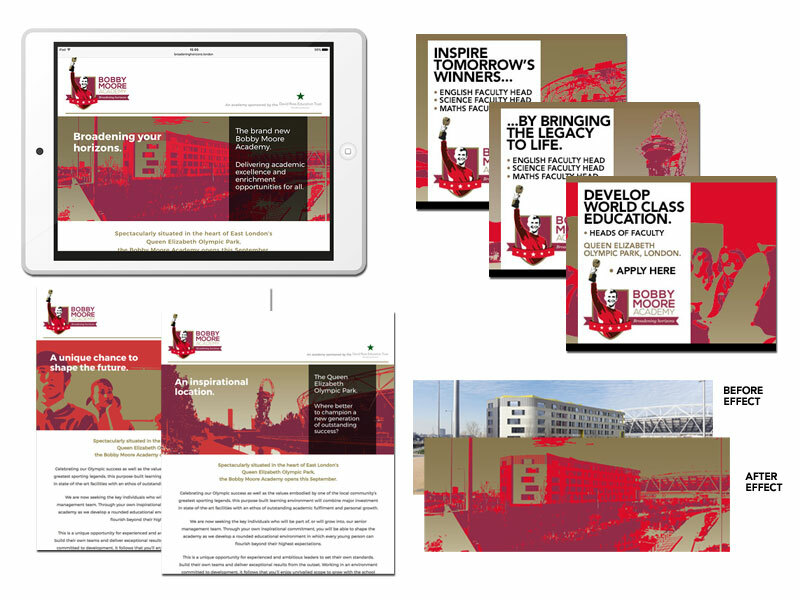 The Bobby Moore brand would have it’s own very special impact, especially in the East End of London, and therefore we promoted this through a simple yet highly effective landing page (www.broadeninghorizons.london) that used some very distinct image effect that we created. The recruitment social media plan drove traffic to the website and we had a campaign using LinkedIn pay per click advertising, and banners on the Guardian’s programmatic advertising platform to support it. The campaign results were impressive with over 2,500 click-throughs to our landing page. All four roles have been filled and the lessons for the next stage of the recruitment campaign for the Academy have been learnt and is being rolled out.